Leeds United have completed their first business of the final day of the transfer window with midfielder Michael Tonge leaving to join Millwall on loan for the rest of the season. Tonge, 31, whose contract with Leeds is set to expire in the summer, has swapped one relegation fight for another in joining United’s Championship relegation rivals, but hopes to get more regular football than he has had in recent months at Elland Road. Tonge has made 12 appearances in all competitions so far this season, but has not featured since Boxing Day’s Elland Road defeat to Wigan Athletic. He has been with United for two-and-a-half seasons and was signed permanently from Stoke City in January 2013 after establishing himself in the side while on loan. He was a regular in the side during the 2012-13 campaign, making 39 appearances and scoring five times, then playing 25 times last season. It was believed Tonge would be involved in a swap deal with Millwall’s West Yorkshire-born winger Martyn Woolford heading north in return, but Leeds’ deal for Woolford has hit a snag today. United, meanwhile, are interested in signing Catania forward Edgar Cani if they can get the deal through today and they have denied that Rodolph Austin is going to Wigan, as reported on Sky. Wigan have put a bid in for the Jamaican midfielder, but as it stands now Leeds have turned it down and head coach Neil Redfearn has said he would like to keep the player. A statement from chairman Andrew Umbers said: “The club can confirm that midfielder Rodolph Austin is not for sale and will remain a Leeds United player beyond Monday’s 11pm transfer deadline. 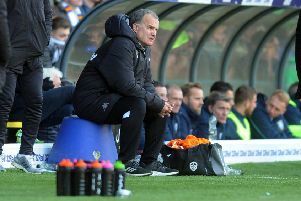 “There has been significant interest in the player and media reports over the weekend and on Monday had suggested that the club had agreed a deal for Rudy to exit Leeds United, but this is not the case. “Rudy remains a vital part of Neil Redfearn’s squad and will play a major part for Leeds United in the remaining 18 Sky Bet Championship matches and beyond. “The midfielder has expressed a desire to remain at the club and help head coach Neil Redfearn make the season as successful as possible.